Lobsang Sangay, See You in Court! Wherever Lobsang Sangay has turned up for public engagements, he has been greeted with protestors who are unhappy with the corruption exhibited by the Tibetan leadership. It has been a trying few months for the President of the Central Tibetan Administration (CTA) Sikyong Lobsang Sangay. Since he trounced political rival Penpa Tsering in the 2016 Sikyong elections, nothing has gone right for him. Post-election tensions ran high between the former candidates so to pacify him, Penpa Tsering was given the consolation post of North America’ donjo (the Dalai Lama’s representative). This position is highly coveted amongst the upper echelons of the Tibetan leadership because it comes with wealth and privilege, thanks to plentiful opportunities to meet liberal American sponsors and donors. However, in November 2017, after Sangay’s sudden and unexplained dismissal of Penpa Tsering from the donjo post, his ratings took a real nosedive and have not recovered since. Things continued to go from bad to worse as nearly one hundred Tibetans, calling themselves the “Truth Seeking Volunteers”, have been protesting Sangay wherever in the world he has travelled to. 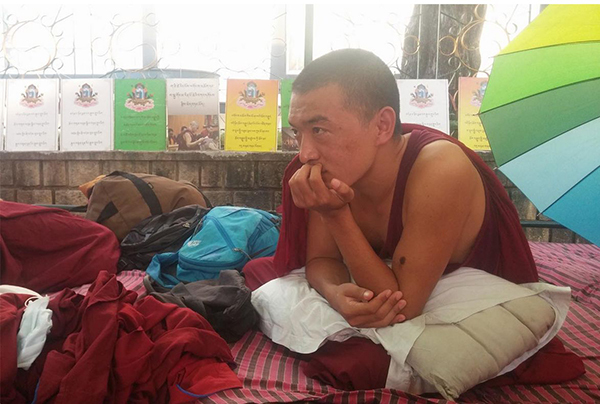 Most recently, they camped outside the Tibetan Parliament-in-Exile for ten days (March 14th to 24th), protesting against Sangay while the Parliament inside debated about the Penpa Tsering issue, although they were supposed to be discussing budgetary concerns. 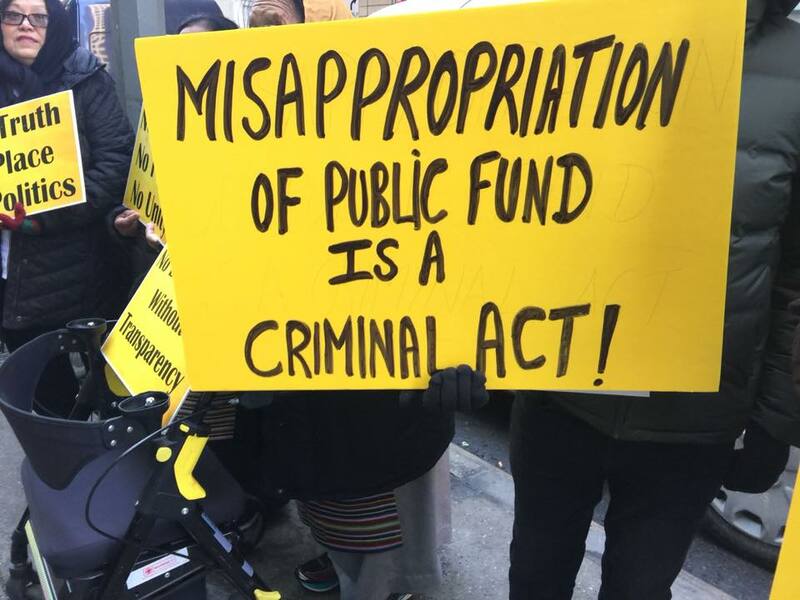 The protestors’ demands include greater clarification regarding Penpa Tsering’s dismissal, as well as an explanation for the US$1.5mil which went missing from the Tibet Fund and appears to have been mis-accounted for at best, and embezzled at worst. It was not until the tenth day that 14 members of parliament met with representatives of the protestors, appearing in their personal capacity to listen to the concerns of their constituents. The fact that the target of the protests, Sangay himself, refused to meet with anyone is a clear indication that he would rather attend to more financially lucrative endeavors, and he has no interest in resolving issues that actually concern those who voted him into power. Not only did Sangay snub his constituents but he added salt to the wound when he haughtily challenged them to take him to court if they were unsatisfied with the Cabinet’s decisions. Sangay’s behavior confirms the opposition’s claims that he does not behave like a democratically-elected leader of the people, but is more akin to an arrogant, self-serving dictator who sees no need to be answerable to the electorate. Hence, due to Sangay’s ego, he is willing to waste even more Tibetan taxpayers’ money and time in fighting his own Tibetan people in court. Has he not done enough damage already with his other divisive policies like the ban on Dorje Shugden, and his refusal to given equal parliamentary representation to the Jonangpas? One of the nine hunger strikers of the followers of the Jonang sect. They are outside the CTA’s (Tibetan Parliament) office in Dharamsala demanding for the discrimination against their sect to end. The CTA or Central Tibetan Administration are well known for their corrupt and unjust ways of handling their people. The Jonang sect was banned in Tibet by the 5th Dalai Lama for over 400 years until recently. Now they want representatives in the Tibetan Parliament which is not allowed to them. The same discrimination and much more is also targeted against Dorje Shugden followers. Would it not just cost less for Sangay to answer his people’s questions face-to-face, or is honesty really that difficult for him? This kind of typical behavior from the Tibetan leadership shows Sangay’s lack of foresight and care for the CTA’s image as a whole. As it is, the Tibetans in exile are facing more challenges than ever before, with their main sponsor and host country India dumping them in favor of relations with China. Yet, instead of uniting the Tibetan people, Sangay chooses to divide them further by challenging his own people to sue him. Does he not think something like this will reflect badly on the Tibetans, not to mention the Dalai Lama, when everyone sees Tibetans fighting one another so publicly, forever airing their dirty laundry? 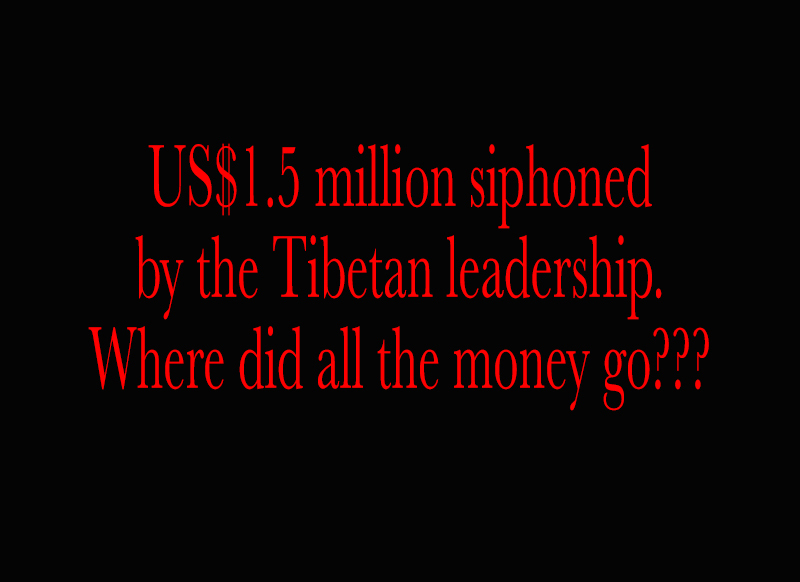 Now we see the truth about the Tibetan leadership’s undemocratic ways. Real democracy allows the people’s voices to be heard and good leadership means facing these voices and answering them. Unfortunately, the Tibetan leadership has no experience at being held accountable for anything since no one has ever dared to speak up against the injustices they commit. But that was in the past, at a time when it was unthinkable for Tibetans to protest against their leaders. The world nowadays is a very different place and protests have become commonplace. If the once-unthinkable protests show no signs of abating, then Sangay would do well to realize it is only a matter of time before he will be forced to make good on his fighting words. There are plenty of Tibetans who are angry with him, and who possess the resources to take him up on his challenge. And let’s not forget the ever-watchful eye of the Dalai Lama, who may just step in and oust Sangay if the protests grow too large, and the protestors grow too vocal. It is time for Sangay to step up to the plate and start making real amends or step down as leader, because his behavior is, to put it simply, bad for business. Yes, the world and the Dalai Lama are watching so Sangay, it is your move. Tibet Sun: What if the protesters bring Lobsang Sangay to court? Lobsang Sangay had extended the fight for Tibetan cause for another 50 years and it will most probably be the same. An additional 50 years will not make any difference to them because the leadership is still the same because the Tibetan leadership that is fighting for their independence is still the same group of people that were fighting for it for the past 60 years? If they can’t even get progress in 60 years, what makes you think that they can do it in another 50 years? Everyone will be dead in 50 years and the problem will be thrown to another group of young Tibetan leaders to solve. I am sure Lobsang Sangay is thinking about it and that is why he has extended the fight. He is not willing to take the responsibility that the fight is a failure. This is how sneaky he is. Just like how he is being caught with several sexual assault claims and yet he still shamelessly remained as the president of the Tibetan leadership without making any apology or statement. He just brushed it aside and Tibetans actually let him get away with it.